You may have heard some building buzz around a few new things at SOLIDWORKS World, a space dubbed “The Hive,” and the SOLIDWORKS World Community. What are they, why should you be interested, and what can you expect? First up is The Hive. If you were to roll a networking area, snack bar, lounge, and game room, all into one space, The Hive is what you would end up with. Add in some entertaining activities including a building brick sculpture, replica roller coaster, and the return of the “I Nerd Out For…” buttons, and you’ve got the event’s go-to location for fun. While all attendees are welcome to drop by, The Hive’s true focus is on first-time World attendees (AKA newbies). “World” style events are, by nature, designed to be exciting, and SOLIDWORKS World is no different. Sessions and booths, conversations and pitches, staff and crowds of people, lights and sounds, all vie for attendee attention. It can be a mind-blowing experience, and The Hive is there to bring some sanity to the chaos for novice attendees. Grab a cup of coffee and a snack, play a set on Rock Band 4 with friends, meet the User Advocacy team, network with User Group members, and learn more about the event from our Ambassador team. You can also register for your 3DEXPERIENCE ID and get support for issues with the SOLIDWORKS World Community. The Hive is located on the second floor balcony, across the concourse from the Partner Pavilion. It is open 7am to 4pm on Sunday, 7-10am CT Monday through Wednesday. 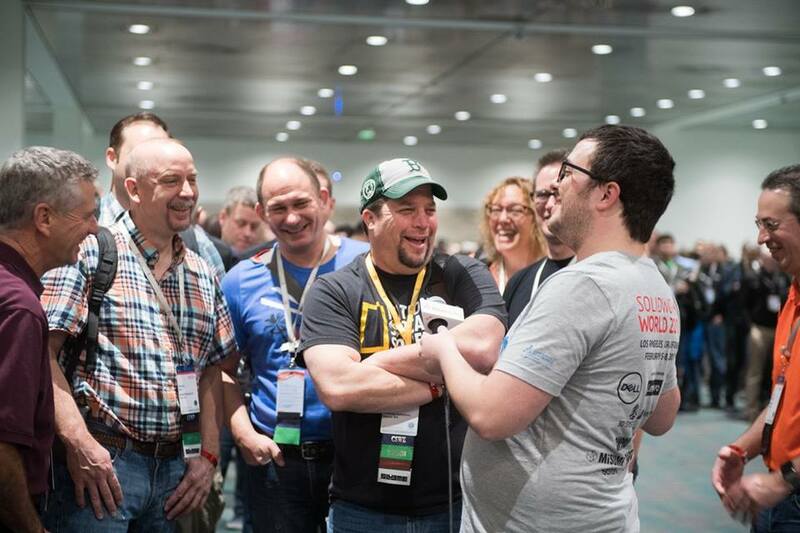 The other new initiative from the User Advocacy team is the SOLIDWORKS World Community. Hosted on our 3DEXPERIENCE Swym platform, this will be your online destination for event news, updates, links to other products within the 3DEXPERIENCE family, conversations and discussions. Throughout the event, we will upload speaker bios, presentations, videos and photos from general sessions and the show floor. After the event, we will continue to provide 2019 event content, upload frequently requested presentations and demos from previous years, and bring awareness to future events that SOLIDWORKS will have a largescale presence. The Community will go live shortly before the start of SOLIDWORKS World 2019. Stay tuned for the official launch date. Already have a 3DEXPERIENCE ID? You’re all set to take a dive into the community! If not, you can create an ID in advance by visiting the SOLIDWORKS World Community and following the “Create your 3DEXPERIENCE ID” link. On-site ID creation will be offered at an information desk located in Registration area at the event, and Ambassadors will be on hand at The Hive for further assistance. On behalf of the User Advocacy team, we are looking forward to seeing you at The Hive and in the Community!